I like your website–it is informative. I am a naturopath and need a crown. I’m concerned over some of the materials used. After my research, so I far like the look of the ceramic crowns (is this glass?) and wondering what Vita ceramic is made out of. I’m finding it hard to get an answer. I basically don’t want any with metals or lithium as I have thyroid issues. Any crown that is all ceramic is not going to have any metal in it. But I’m reading between the lines of your question, and I think you are asking about avoiding any metal ions in the crown. I don’t believe this is going to be possible to do, as there are metal ions in every dental ceramic I am aware of. Let’s get into a little chemistry. Iron is a metal. Rust is iron combined with oxygen–iron oxide. While rust isn’t a metal, it has metal ions in it. And while you wouldn’t want to eat metallic iron, of course, iron ions are essential to life. They’re an important ingredient of our diet, since the hemoglobin in our blood has iron ions in it. The iron in our blood is what gives blood its red color. Similarly, sodium is a metal. As a pure metal, it is toxic, but combined as a metal ion with chlorine it is sodium chloride, or common table salt, and is also essential to life. Other metal ions that are important ingredients in our diet include calcium, potassium, magnesium, zinc, copper, manganese, molybdenum, and cobalt. Lithium is a metal that is in the same family as sodium. It is so reactive that it doesn’t occur freely in nature, so it is found naturally in its ionic form combined with other elements. Lithium disilicate is a ceramic that is very strong and has been developed in the past few years to be used in dental crowns. I have in my mouth an e.max crown, which is made of lithium disilicate. Zirconium is another metal. Combined in its ionic form with oxygen, it is known as zirconia, and is a ceramic that is even stronger than lithium disilicate and has also been developed recently to be used in dental crowns. It is so strong that it can be used in bridges without requiring a metal framework, something that is very risky with other ceramics. You mention Vita. Vita is a brand of porcelain. Porcelain is a conventional ceramic that has been used for many years for dental crowns. It isn’t very strong by itself, but when it is bonded to tooth structure, it is strong enough for crowns on front teeth and premolars. Dental porcelains are made with kaolin as a key ingredient. Kaolin is a clay that has silica and aluminum oxide. Aluminum again is a metal, but it isn’t aluminum metal that is in these crowns but aluminum ions. Glass is pure silica (silicon dioxide). Silicon is not a metal, but glass isn’t strong enough to be used as a crown, though there are some crowns that use a layer of glass on the outside (Empress crowns). However, the glass they use in Empress crowns is a leucite glass that has aluminum tectosilicate in it. So you can take all of this information and figure out what you want to do. I am not aware of any biocompatibility issues with any of these ceramics. However, if you were to ask me my opinion about which one would be least likely to provoke any biological reaction, I would say the zirconia. Should I consider leaving my current dentist? When I first met my dentist, I was amazed a how incredibly fast he could trim down a tooth for a crown. It seemed like less than ten seconds. However it now seems as though he shaved some teeth down too far. Two of his crowns have fallen out twice, and there does not seem to be much tooth left to hold them. Could it be that he was working too fast and took too much off of the existing teeth? I am not planning on suing but I cannot afford to lose any more teeth to his crown work, and cannot afford implants at the moment. Should I seek out a different dentist? Is there any guarantee with a crown? While there is not really a guarantee with a crown, there is a concept in dental care called the standard of care–a minimum standard that an average dentist should provide his or her patients. There may be situations where there simply isn’t much tooth left to hold the crown on, so even a dentist who is doing everything right could have problems with an occasional crown staying on. But if there are recurring problems with crowns from a particular dentist with crowns falling off, that could indicate a breach of the standard of care and the dentist could be liable. I realize that you don’t want to sue, and I’m not suggesting that. But knowing the dentist’s liability can be used to give you a bargaining position to get things fixed correctly without having to pay another dentist to do this over. You say that two crowns have fallen off twice, and that you could see there wasn’t much tooth left on these teeth. While I don’t know the history of these teeth, that, together with your description of how little time this dentist spent on the crown preparations, suggests to me that the teeth were prepared with too much taper. 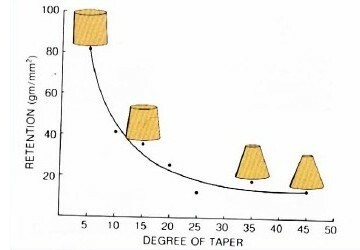 I refer you to my earlier post on this subject, The Main Reason Your Crown Probably Fell Off, where I explain the role of taper. In over 20 years of dental practice and placing many hundreds of crowns, I never had a crown that I placed fall off. I say that not to brag but to make the point that if a tooth is properly prepared and a crown properly cemented, it will stay on. Yes, it takes more time and trouble to prepare a tooth precisely so the crown stays on, and it is also more time and trouble to seat and cement a crown with an ideal preparation, which is why most dentists compromise on the ideal preparation a little bit. It sounds like your dentist compromises a lot in the interests of speed. So to get to the point. Yes, if I were you, I’d find a dentist who does crowns that stay on. And then I would get these two teeth fixed with crowns that stay on. It may be necessary to have new crowns made. Even if a tooth is over-prepared, there are ways to modify the preparation, either with retentive grooves, or with a buildup and possibly the use of pins, so that a crown will stay on better. Or, depending on the material in the crown, it may be possible with bonding technology to get a poorly prepared crown to stay on. I would find a dentist who can take care of this for you, and ask that dentist to help you get some type of refund, even if it’s a partial refund, from your current dentist. Why does my crown keep falling off? I have had a crown put on by a dentist and it was done same day. No temporary. Not sure what type of material he used for the crown. It fell out three times in less than a year. I went to a different dentist on the fourth time it fell out and he replaced the setting with a new one stating the other dentist didn’t create a good setting. This new crown is Zirconia Porcelain and it has fallen out twice in a month. He is suggesting a full porcelain crown on the same setting as he states the cement is adhering to my tooth but not the crown. He says the all porcelain has a more rough underside to adhere to the cement better. Any suggestions on what my next move should be? Your same-day crown was a CEREC crown or a similar type that is milled by a computer in the dental office while you wait. But when properly prepared and bonded on, it will stay on permanently. It’s not the material your crown is made of. Gold crowns, porcelain crowns, CEREC crowns, zirconia crowns–all of them can be made to stay on solidly, permanently. I have most of those types of crowns in my own mouth and they stay on just fine. There are two main factors for retention of a dental crown–the bonding strength of the cement, and the shape of the tooth preparation. Of those two, the shape of the tooth preparation is far more important. If the tooth is prepared with only a slight taper, a crown can be cemented with a very weak cement and it will still stay on. 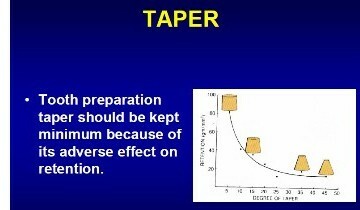 If it is prepared with a lot of taper, some of the strongest cements will not hold it on. I’m not saying that getting a good bond between the crown and your tooth wouldn’t solve your problem. The strength of the cement is a factor. And I know very little about your tooth and the techniques these dentists used. But I do know that a tooth prepared with good retention form will not have a crown falling off three times in less than a year, regardless of the cement used. So even though I know very little about your tooth, I’m pretty confident that it was prepared with inadequate retention form. So what should your next move be? I would find a dentist who knows how to do crowns that stay on. In 23 years of dental practice, I never had a crown fall off of any that I did for my patients, so I know it can be done. Do I really need this crown on a root canal tooth? I had a root canal done on a molar almost 5 years ago. After the dentist did the canal he put in a filling which has recently come out. I went back and he has told me I need a crown put in with posts, I was wondering if this is necessary rather than just getting another filling? What are the pros and cons of crowns? and is it strange that he didn’t originally put in a crown as there’s not much of the tooth left and I think he probably would’ve known the filling wouldn’t last. Any help would be great as I really don’t know what to do. The only puzzling part of your situation is why the dentist didn’t recommend a crown when the root canal was first done. Now you’re in Ireland where much of the dental care is publicly funded. I’m wondering if that has something to do with this. Not every tooth that has a root canal treatment needs a crown. I’ve written before on this blog about the need to be careful in doing crowns on front teeth that have root canal treatments, as a crown will weaken a tooth against lateral stresses. But practically every molar with a root canal treatment does need a crown. The reason is that once a tooth has a root canal treatment it tends to become more brittle over time and more susceptible to breaking. Molar teeth in particular are the most susceptible of breaking in this circumstance for two reasons. They are the teeth furthest back in the mouth, so they receive the greatest chewing pressure. Furthermore, because of their cusps, the stresses on them tend to separate the cusps, which subjects them to a high risk of cracking in two. A crown will protect the tooth against cracking in two. So yes, I would do the crown. And a post or posts would be needed if there isn’t much of the tooth left to hold the crown on—if the tooth is mostly filling. Otherwise you wouldn’t need a post. I happened across a website the other day, Oral Answers, that had a post, “Six Reasons Why Your Crown Fell Off.” As I read it, in my mind it highlighted the difference between this website and other dental websites. The dentist writing this gave six “politically correct” possible answers that pretty nearly absolve dentists of any responsibility in this mishap and skirt the main cause. The author of the website appears to be a nice guy. He is a dentist and identifies himself only as Tom. And it’s not that the information is incorrect, it’s just sanitized. It seems to adhere to the philosophy I’ve had preached at me from other dentists, that we professionals need to stick together and defend each other. And so Tom, rather than frankly explain what he was taught in dental school about crowns falling off, instead tries to portray dentists as nearly infallible. For me, I can’t bring myself to do that. I need to tell it like it is and let the chips fall where they may. My professional duty, as I see it, isn’t to make other dentists look good but to help the patient. Here are the six reasons Tom gives, with my comments on each one. Again, they’re all true. It’s just that he leaves off the main reason, which is what he and I were taught in dental school. So after I list his six reasons, I’ll let you in on a dental school lecture about the main reason crowns actually come off. 1 – The tooth underneath the crown got decayed. This will definitely cause the crown to come off. However, if you are having regular checkups, your dentist will spot this decay well before it is extensive enough to cause the crown to fall off. This is the closest he comes to faulting the dentist. But I preserved his solution because he presents this as so easy to fix that it makes the dental mistake easy to forgive. In reality, I would attribute this cause to fewer than 1% of crowns falling off. I don’t think I ever saw a case like this in my practice. 3 – You ate too many chewy foods. I was never taught in dental school to advise my patients with permanently cemented crowns not to eat chewy or sticky foods, and I never told them that. I will add that in 23 years of practice, I never had a crown that I put on just fall off, and my patients ate jelly bellies, taffy, whatever. I also have eight crowns myself and don’t observe any diet restrictions because of them. But if you do have a borderline crown or a temporary crown, yes, sticky foods will give you problems. 4 – The crown broke. Again, this will do it, but it rarely happens. I’m trying to remember if I ever saw a broken crown in my practice. I may have seen one or two over my 23 years. In the old days, some pure porcelain crowns would break if they were used too far back in the mouth. 5 – You abused your crown. He mentions grinding your teeth or using your teeth as tools. Yes, he is correct, this will stress your crown, but if the crown is done well it won’t be enough to loosen it so that it comes off. 6 – There wasn’t enough tooth structure to hold onto the crown. Here he’s getting close to the main reason that crowns come off. This happens most often with short teeth. However, we dentists are taught how to address short teeth and get a crown to stay on. There are retentive grooves and other preparation features we can put into the crown preparation to deal with a short tooth. Now let’s go to our dental school training. 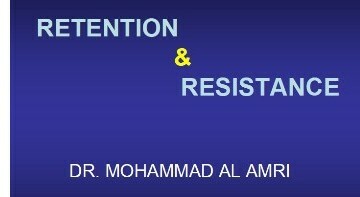 Here are a couple of slides from a dental school lecture. Dr. Al Amri is teaching his students crown retention and resistance forms, the two principles involved in crown preparation that keep the crown on the tooth. He explains to the students that the greater the taper in the crown preparation, the less likely the crown is to stay on. In his graph, which I have enlarged below, he teaches that by tightening up the taper, the dentist can increase the retention dramatically. This seems like a simple solution and you may wonder, then, why every dentist doesn’t just prepare the teeth with minimum taper. There are a couple of reasons. First, to prepare a tooth with minimum taper requires a lot of precision. What if the dentist is off just a little bit? He or she could end up with what is called an undercut. I’ve illustrated that in this small diagram below. In an undercut, the tooth preparation is narrower at the bottom than at the top. Having even the slightest undercut makes it impossible to make a crown to fit—it simply won’t slide on the tooth. If there is a small undercut in just one small part of the preparation, the crown won’t work. And the less taper there is in the crown, the more time and effort it takes to tell if you have an undercut. The second reason is that the tighter taper makes it harder to seat the crown. The tighter taper, which makes it hard to dislodge the crown once it’s on, makes it harder to get on during the seating appointment. Any irregularity in the surface of the tooth or the internal surface of the crown needs to be resolved. There is less room for error. A dentist can avoid these issues by simply creating more taper in the crown. And some dentists do just that. They may not be intentionally taking shortcuts—they may just lack confidence in their ability to create a perfect crown, so they just shoot for acceptable, with the result that they have some crowns that end up falling off. In my practice, I always prepared crowns with as little taper as I possibly could, and in 23 years I never had a crown fall off. However, I did see crowns done by other dentists that did come off, and most often these were crowns with inadequate retention form—too much taper. We dentists, when we talk among ourselves, will talk about this issue of crown retention, and we fully understand that we are pretty much in control. But many dentists, when they are talking to patients, don’t feel the inclination to be quite so honest, for fear it will tarnish the profession. That’s their mindset. But it’s not mine. I recently had a CEREC crown put in. I was told how great the CEREC was going to be, and that this was supposed to fit perfectly. But it didn’t seem to go that way. I ended up spending about three hours in the dental chair. My dentist said she had to take a generic image from the database because my tooth was in such bad shape. And then the crown didn’t fit when it was made. I was watching the screen on the machine when she was making it, and I noticed a lot of red area. And then when she tried to put it on, it didn’t fit. She had to hand grind the sides and a lot off the top. It looked like it was sitting up really high and she had to grind it a lot. And then now it looks like it’s a little lower than the teeth next to it and doesn’t look like a natural tooth. It doesn’t have the bumps on it like my other teeth have, and seems a little wider on the outside at the base. Also it seems a little sensitive. I don’t know if that’s normal for a period of time or not. Its been almost a week. It just don’t feel strong. I wonder if it is not seated in properly. Now when I went to the CEREC site, it looks like this was supposed to be a near perfect fit and would only take a few minutes to put in. And only minor modification if any. I also sen the image of how it looks when they take the image. My tooth looked identical to this, so Im a little concerned why she is saying it was because the tooth was in bad shape as to why they couldn’t fit it right or get a proper model of it. It looks from the site that they could make a copy of the top tooth to know how it would fit. But my dentist only took a image of the prepared tooth, so that doesn’t seem right. So I want to know if my dentist did something wrong and is she trying to cover it up? and what about the sensitivity – why is that? You’re correct that something isn’t right with this crown. I can’t pin down from your description exactly why you had this bad experience, but you’re right that it shouldn’t have been this way. The initial comment that your dentist made about having to take a generic image from the database because your tooth was in such bad shape–I’m not sure what to make of that. The CEREC crown system is made to deal with teeth that are in bad shape. Teeth that are in good shape don’t need crowns. The CEREC software asks the dentist to input which tooth is being crowned. For example, the dentist would program in that you need a crown on your upper left first molar. CEREC is set up to recognize how that tooth is supposed to look and gives the dentist a starting point for designing the crown. Then the images of the surrounding teeth and the opposing teeth should give her the information the machine needs to fit the crown perfectly onto your tooth and into your bite. Clearly, from all the grinding she did and what you are telling me about the shape looking funny and the tooth looking low, that didn’t happen. Why? One possibility is that she didn’t really know what she was doing. Another is that there was some problem that she didn’t tell you about such as that your gums were bleeding so badly that she wasn’t able to get good pictures of your prepared tooth. There are a lot of things that can go wrong with a crown. In dental school, the first operative procedure your dentist was taught was how to do fillings. Only after she mastered that was she taught how to do a crown, because a high level of skill is required to do a crown and there are a lot of things that can go wrong. If the crown doesn’t fit the tooth perfectly all the way around, for example, the crown will have what is called an open margin–a gap through which decay can enter. Decay that gets into a tooth under a crown can ruin a tooth. If the bite isn’t designed correctly, it can lead to soreness in the tooth or TMJ problems. If the sides aren’t contoured correctly, it can lead to gum inflammation and gum disease. From the sounds of what you described, it seems like your dentist may have just sculpted the crown freehand in your mouth, which is a recipe for all kinds of trouble. You mention sensitivity but you don’t say whether it is steady, increasing, or decreasing and whether that is sensitivity to cold, to sweets, to biting, or to something else. If it is steady and caused by either cold or food or air, my guess would be that is from an open margin. An open margin would probably mean the crown needs to be re-done. You definitely want to get another dentist to look at this. And, assuming the crown has to be re-done, your dentist should pay for that. Don’t demand just a refund, but you want her to pay for the replacement crown and anything else that may be required to fix this, which may be more than what she charged you for this defective crown. A couple of little tips on getting this second opinion–do not tell the second dentist any of this that you told me. Just tell the dentist you were questioning the crown and say that you don’t really want to say any more than that, and you want his or her opinion on the crown based alone on what he or she sees, not based on your story. Don’t give the name of your dentist. You want a blind second opinion. The more you say, the more you telegraph about the answer you’re expecting, and that can color the opinion you get. And you don’t want the dentist influenced by any friendship or animosity they may feel toward your dentist. If they press you for more information, say that you’ll be happy to share that after they tell you their opinion about what they see but not before. Oh, and be willing to pay for an x-ray so that the dentist can fully evaluate this. There are various types of pain that you can have when you are wearing temporary crowns, or when you have a new crown. Some are serious, and others aren’t. Three weeks is a little long to be wearing temporary crowns. The last week you were wearing them and they smelled and then started to hurt, what was happening there is that they were beginning to leak, and microscopic particles were getting in between the temporary crowns and the teeth. Those trapped particles started to smell, and since they were in direct contact with the porous dentin of your teeth, they would also irritate the teeth. I have had that kind of pain while wearing a temporary crown, and it was very uncomfortable. I do think your dentist should have explained better what would happen once the crowns were cemented. The cement is an additional irritant of the tooth, and the sensitivity could increase right after they are cemented, but then it would gradually subside and disappear. If it didn’t subside and go away, it would mean that the irritation was too much for the tooth, and it may end up needing root canal treatment. The pain to biting is probably a separate issue. I would assume that the bite just needs to be adjusted until it is comfortable. There is a chance, however, that everything – all the irritation from being worked on, etc., has caused the pulp in one or both of the teeth to die, which would then begin to irritate the ligament that holds the tooth in. It would be prudent, at your next checkup, to ask that the roots of these teeth be x-rayed, just to make sure everything is okay. Especially if the sensitivity to biting or chewing never really completely goes away. Is it common for a dentist to leave cement in a mouth that had a crown? My gums were hurting from the temporary crown. After the permanent crown was put on he said in a few weeks my gums would heal. They didn’t. I finally took tweezers and anything else I could find and pulled out a piece of cement under my gums. NOW my gums are healing. I felt instant relief after extacting this piece of cement. A 7 week ordeal. This is a “no-no”, for a dentist to leave cement around a crown, and it will cause gum inflammation until it is removed. I wouldn’t assume that you got all the cement but would make an appointment with the dentist, explain what happened, and say you want it checked carefully for any residual cement. If cement is left in there long-term, it can contribute to irreversible gum disease.